The Oceanis 55.1 is a boat for big exciting projects and she is as appealing to the eye as she is easy to manoeuvre. 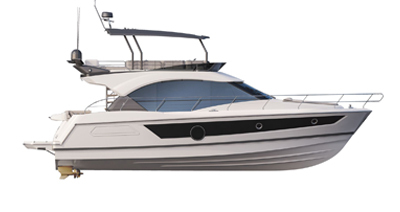 This cruiser is a gentle step towards the world of large yachts. 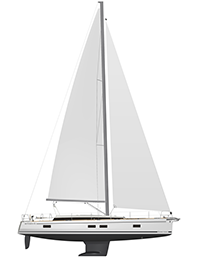 In the cockpit, at anchor, on deck or inside, the Oceanis 55.1 offers generous well-ventilated spaces. With rectangular portholes offering a view of the horizon, there is plenty to see and lots of light in all circumstances. Combined with the cockpit’s L-shaped seats, the two sun-loungers on the roof cleverly provide extra places to relax outside. At anchor, the huge aft platform lowers to provide a terrace at sea level. Her hull stands out for its bold taut lines and its colour can be personalized over and over again, making her an unprecedentedly stylish cruiser. The unique design centres all the winches at the helm station so that all manoeuvres can be carried out alone. This is very reassuring on a 55 foot sailing yacht. Twin steering station: integrated multifunction helm consoles (storage, drink holder, grab rails, electronics, etc.) Helmsman's seat on full length of skirt, helmsman's seat for heeling. Sail drive engine compatible with Dock&Go technology. Flush deck hatches emphasizing the clear deck lines. Drop-down transom, opening completely, converting into a swim platform (2,85 m x 0,77 m / 9'4" x 2'6"). Electrically-controlled opening. Natural solid wood decking on swim platform. 1 stainless steel swim ladder, removable - solid wood steps. Master suite: very spacious with island bed - mounted on jacks - surrounded by shelves, storage and two large hanging lockers. A cleverly designed chest of drawers with sliding top creating an office space with specific housing for a laptop. Two large aft cabins. A large convivial fully-fitted galley at the bottom of the companionway, with a side view of and close to the saloon: separating unit, large Kerrock worktop, double sink . An ensuite bathroom in the owner suite with separate toilet, a second bathroom with separate shower at the stern. Comfortable gently sloping 45° companionway. An enormous modular saloon: rotating chart table seat with special retractable back increasing the open space around the table. A rotating extra seat forming an L increasing the number of seating during meals. A large sofa (2 m/ 6’7’’) faces this space and puts the finishing touch to the comfort of this space. Coachroof surrounded by flush hatches and skylights for incredible comfort and brightness inside. Windows at the forward end of the coachroof for the master cabin. Two symmetrical fore cabins: double bed and ensuite bathroom including shower, manual marine toilet, washbasin in grey Kerrock top, storage and mirror. Three double aft cabins, one of which with bunk beds. Heads with marine toilet (option). A large convivial fully-fitted galley at the bottom of the companionway, with a side view of and close to the saloon: separating unit, large Kerrock worktop, double sink.